Diners have been given MP3 players at a top restaurant to enhance a dish. 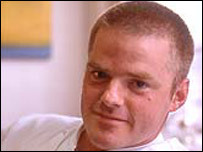 Chef Heston Blumenthal, famous for his scientific approach to food, said the recording of breaking waves heightened the flavour of dish "Sound of the Sea". The owner of award-winning Fat Duck restaurant in Berkshire, said research carried out with Oxford University revealed sound can boost taste. "We ate an oyster while listening to the sea and it tasted stronger and saltier", Mr Blumenthal said. Mr Blumenthal told Square Meal magazine that the tests carried out with Charles Spence at Oxford University "revealed that sound can really enhance the sense of taste". Sound of the Sea, on the menu of the three-Michelin-starred Fat Duck restaurant, features seafood and edible seaweed on a bed of sand-like tapioca - all washed down with the sound of breaking waves. Ruth Penycate, who sampled the dish as part of the restaurant's taster menu, said she was not expecting the musical accompaniment. She said: "The people on the next table must have had the same menu - I'd just thought the guy was being incredibly rude listening to his iPod through the meal. "The waiting staff bring iPod shuffles and invite you to put them on, and after a couple of minutes bring in the dish, which looks like a seashore and even smells briny. "It definitely adds to the experience - the whole thing sets your senses going." The restaurant has also planned whiskey flavour sweet gums served on a map of Scotland and edible crystallised rose petals adorning a silver rosebush sculpture for its menu.